The Ecostrad Thermostrip is the perfect choice for providing soothing heating in a variety of public and commercial spaces. Its easy-to-use on/off functionality offers uncomplicated heating, as and when it’s needed. The Ecostrad Thermostrip is a subtle infrared heating solution that provides soothing heat for a variety of public and commercial applications. Finished in contemporary matt black, the Thermostrip is the ideal choice if you need unobtrusive heating that can blend into the background of any environment. This non-remote version of the Thermostrip has a 2400w output which can be adjusted using the simple on/off button at the side of the heater. We also stock versions of the Ecostrad Thermostrip with a remote for easy, press-and-point control. 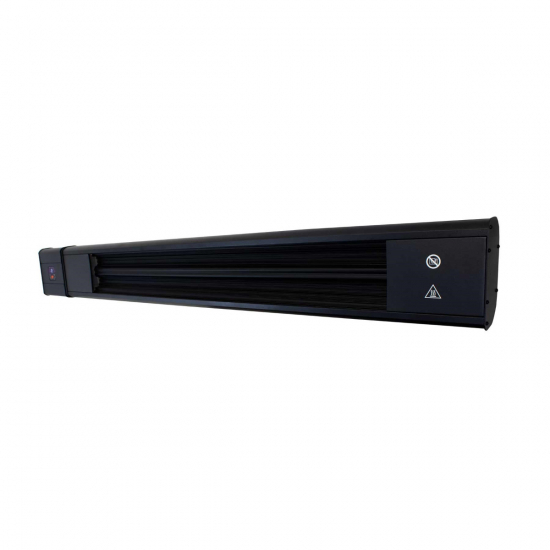 Our Thermostrip heaters produce no light and offer a mellow heat that’s better suited to use over long periods. Instead of a bulb, these heaters use a stretch of wire filament to produce far infrared, a gentler type of radiant heat that mimics the warmth of the human body. This makes the Thermostrip excellent for sheltered outdoor spaces where people may be sat for long periods of time. There’s no distracting light and no overbearing heat, just a constant source of pleasant warmth to keep you comfortable throughout the day. The Ecostrad Thermostrip comes with a robust IP65 protection rating so you can install it outside with confidence. This version of the Thermostrip can heat a maximum area of 18m² indoors or up to 9m² in a sheltered outdoor environment. Whether you’re heating a hotel veranda or a chilly church interior, the Thermostrip will provide reliable and comfortable warmth from a sleek, unobtrusive housing.